Walking Seniors Improve Their Health - easy way to exercise, particularly for aging senior loved ones. 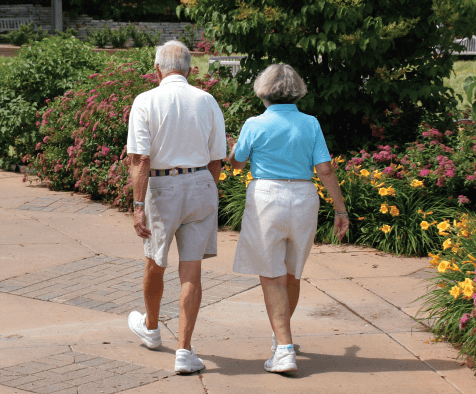 Walking is an excellent and easy way to exercise, particularly for aging senior loved ones. Find a buddy with whom you can walk regularly. A friend can encourage you to walk on days when you aren’t motivated and can help you continue walking at a good pace. Use a pedometer, which keeps track of the distance you’ve walked. This will help you keep track of your steps and can be an excellent motivator that can encourage you to gradually reach your goal. Schedule your regular walks in a PDA or calendar. This helps to ensure that you have a set time every day for walking. If you have chronic medical problems such as heart disease or diabetes, check with you doctor to make sure a walking program is safe for you. Start slowly if you need to – just get started, even if it means just walking around the block. Somewhere between three and four miles an hour should be your goal, but if you have to work up to that gradually, it’s better to walk slowly than to do nothing. Something is always better than nothing!